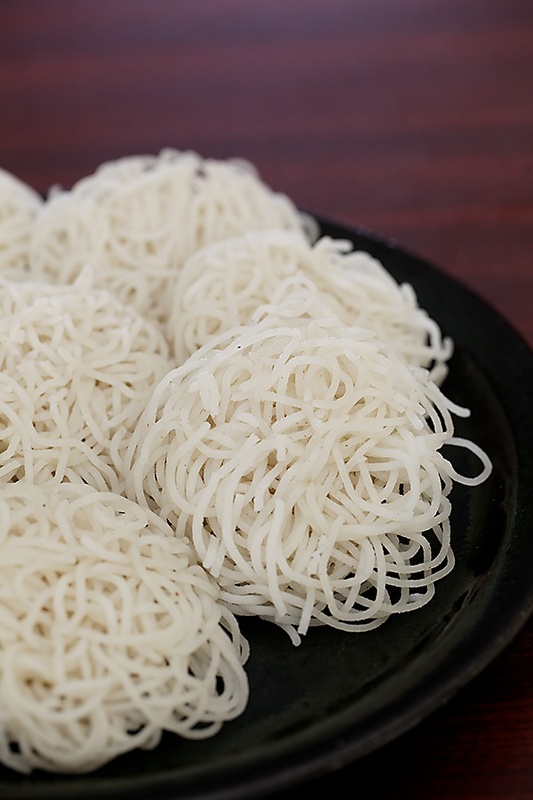 Idiyappam as it is known in Tamil Nadu and Kerala, or Shyavige as we call it in Kannada, makes an appearance on our breakfast table atleast once a week. 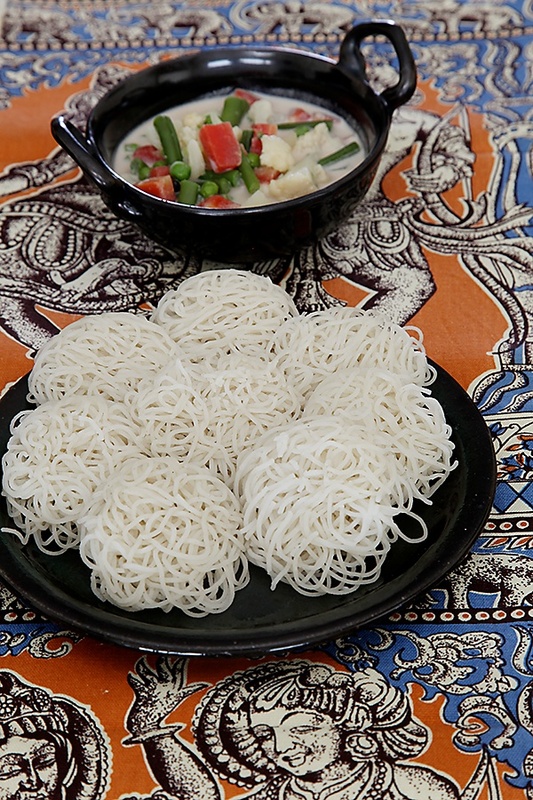 Known as String Hoppers in Srilanka and nu-puttu in Coorg, Karnataka, this is a popular breakfast dish or snack or a side to an elaborate lunch in many parts of South India and Sri Lanka. I have many fond memories associated with idiyappam. My maternal aunt Rekha's cook Chandran used to make excellent idiyappams and they were one of the regulars features of breakfast served at her home when we holidayed with her family. Later on, when I was in college, one of the best idiyappams I tasted was the one made by a dear family friend who also happened to be a young mother at that time. 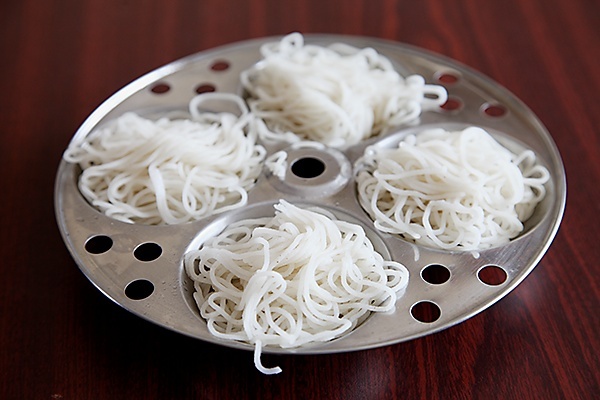 She made the elaborate and tedious version of this dish, starting from washing and soaking the rice, grinding it to a fine paste, steaming the ground paste and then pressing the dough through the noodle press. I cannot forget how good it tasted! Shyavige is also a regular breakfast item in my mother's home and I used to love tucking into them with my grandmother's raw mango pickle known as midi uppinkai. Even to this day, I relish eating this dish with some coconut oil for added taste and drama for the palate. The plain simplicity combined with the texture works like magic on my taste and leaves me content. But, my most precious food memory associated with shyavige has to be the one to do with my little Hari. I vividly remember the day before his first day in playschool, the day he was to step out of home for the first time into a different world. At two and a half years of age, full of curiosity then as he is today, when I asked him what he would like to be packed in his snack box, “shyavige” he said with a twinkle in his eye. The next morning, I woke up at dawn and went about making idiyappam from scratch, along with many accompaniments and packed his snack box with a great deal of enthusiasm, only to realize later that my precious little son had not eaten a morsel. 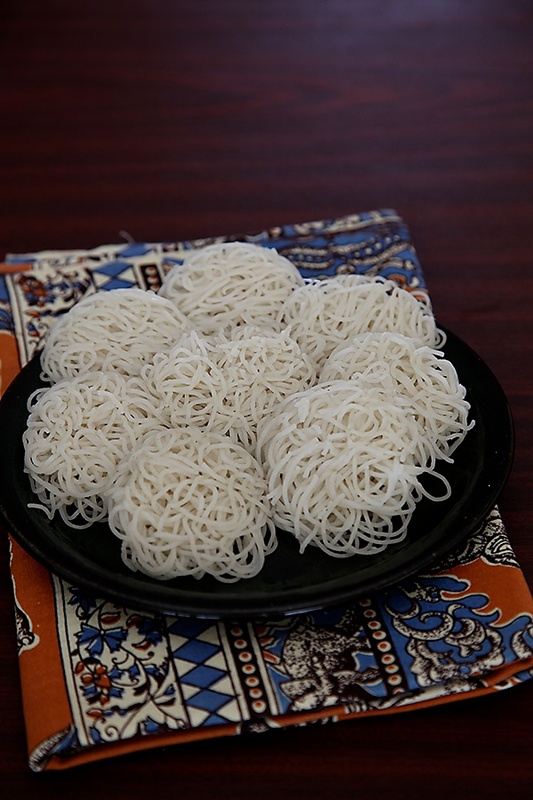 It is quite easy to make idiyappam or shyavige. and you just need three ingredients – rice flour, salt and a little oil, alright four ingredients including water to make this. You do need a few cooking utensils and equipment though. You need an idli steamer that is usually available in Indian homes and is easily available in any store selling Indian cooking utensils. You also need an idiyappam press or a chakli press. 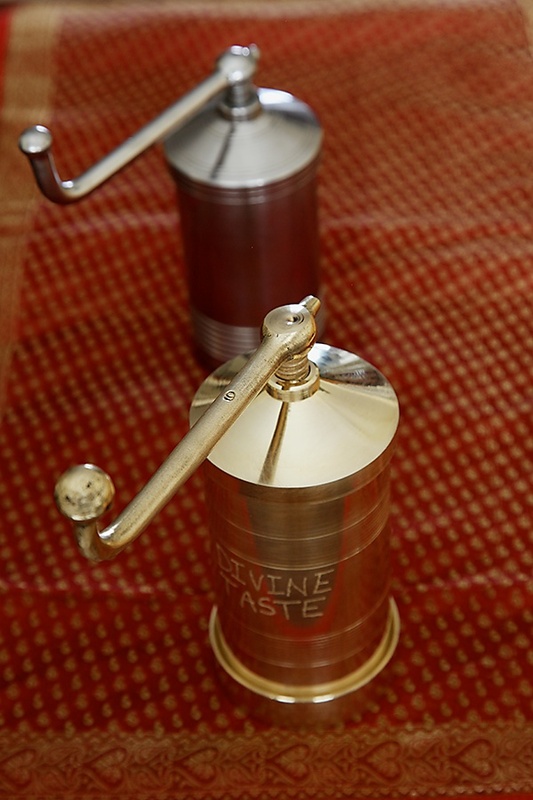 You can make a whole lot of traditional Indian savouries and snacks with this press. 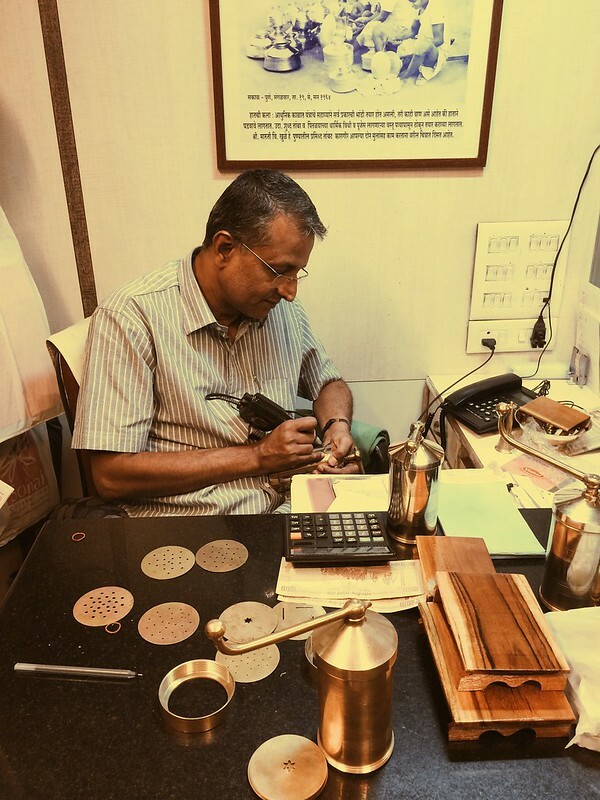 During a recent visit, I went to the old markets of Pune and visited Mr. Khule's shop selling antique brassware . Mr Khule, a very friendly gentleman treats me to home made aloo vadas each time I visit his store. 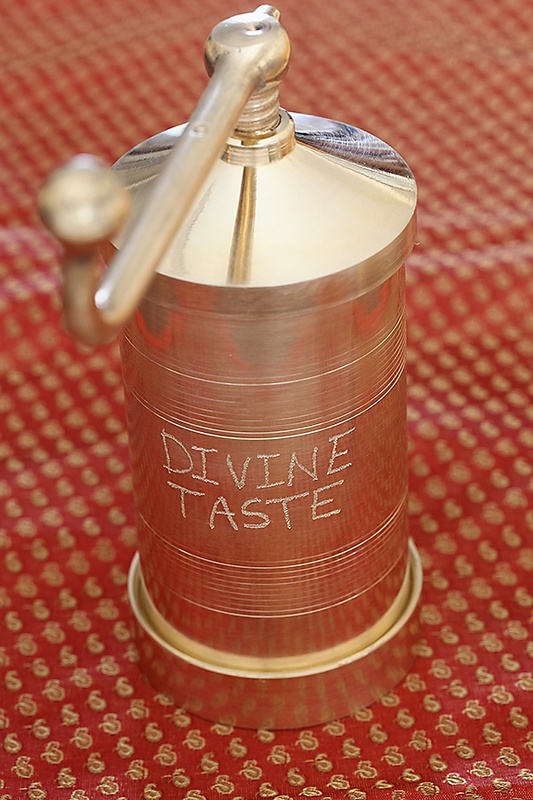 He very kindly inscribed the words “Divine Taste” for me on my chakli press. The story of our life is primarily about the people we meet and our interactions with them and I'm fortunate to come across such kind and friendly folks in my life. Coming back to idiyappam or shyavige, this is one of my most favourite breakfasts and has a culinary history dating back to thousands of years. K.T. Achaya in his book “A historical dictionary of Indian food” talks about this dish being mentioned in fifth century literature. It is served with a whole lot of variations depending on the community and preferences of the individuals. It can be served with a vegetable stew, coconut chutney, pickle, coconut oil, sweetened coconut milk or even plain buttermilk. Whatever the choice of accompaniment, this dish with its special structure and shape is sure to appease your senses. In a saucepan bring about 2 1/4 cups water to boil. Put in the oil. Lower the heat, stir in the flour while mixing continuously for a minute or two before turning off the heat. Keep mixing the batter with the spoon until the flour is mixed well. Cover and keep aside for a few minutes and as soon as you can handle the heat, knead into a smooth dough. If you find that your dough is not smooth add a few spoons of more warm water. Make sure that you do this quickly. If the dough turns dry, the idiyappam wont have a good texture. 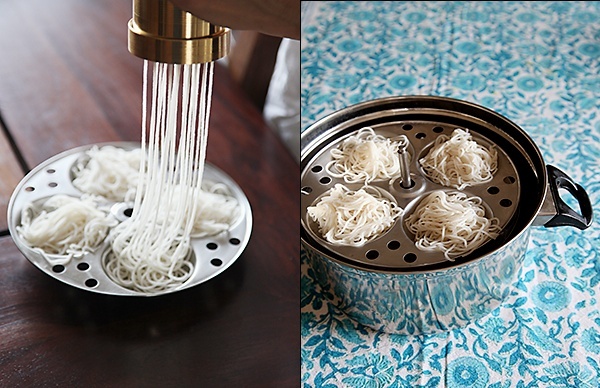 Fill an idiyappam mould with the dough and press into an idiyappam/ idli stand. With the help of the press, make swrirls of the dough in each mould and then cut the dough off, with the help of your hands once it filled. 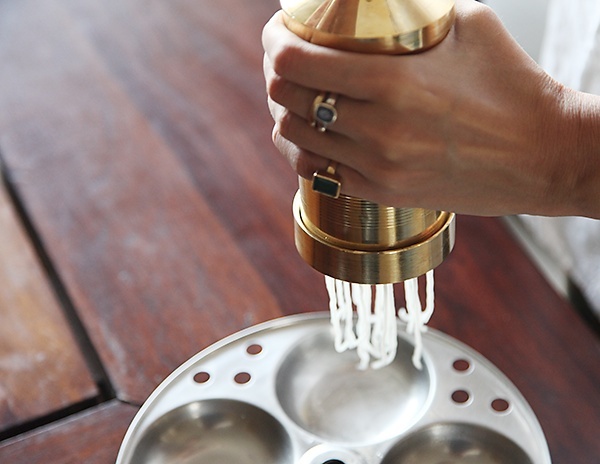 Simultaneously, fill an idli steamer with about 1 ½ cups of water and allow it to come to boil. Place the stand into the steamer with the hot water, cover the lid and steam for about 5 minutes. *Depending on the quality and type of rice flour anywhere between 1 to 1 1/2 cups of water will be needed for 1 cup of rice flour. Makes about 16 idiyappams in a regular sized idli stand. Looks delicious and pure, Anu. The chakli press from Pune looks nice too. Just wish the system of engraving in India improves with time (like the Europeans). jess- Hope you like it! rustoo- Would lvoe to make this for you! coralcrue- He is a very nice person indeed. These stones have been in my family actually. Where do you stay? I love that you observe all tiny details. I have a surprise coming up. Stay tuned! AUTHENTIC! It is a speciality of this site that all the age old and traditional recipes are brought in the limelight with a new look …..wow! can you please tell me where is this shop located in Pune? want to visit. 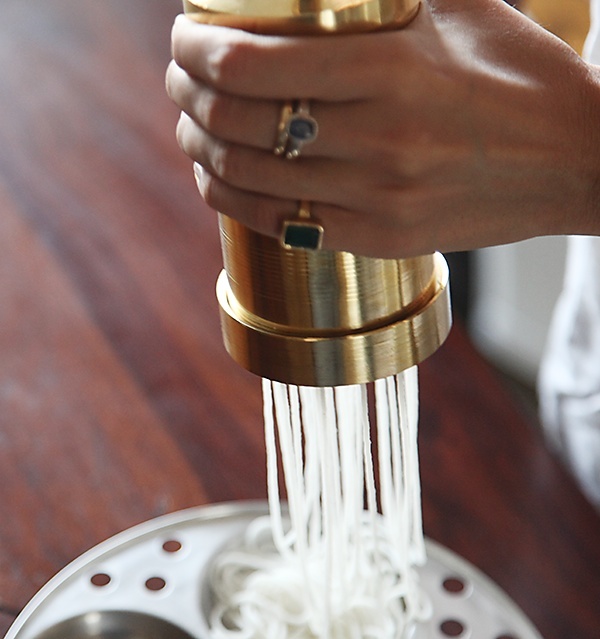 string hoppers are an absolute favourite,tastes yummy with coconut milk..
Shruti: I love to read what you have to say. This shop is called "RaghuKrupa Copper And Brass Pooja articles" (020-24452452) It is on the lane in front of the vegetable market. 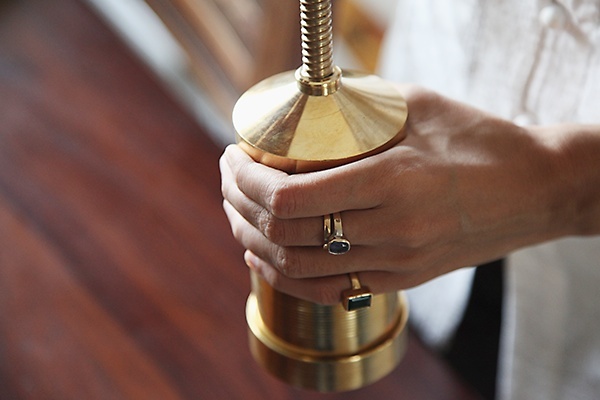 Vidya- Yes, that is one of the combinations for relishing string hoppers. Bhuuvana- Hope I'm not delayed in my response. Yes you can use rice flour for your friend, since rice is completely gluten free. Hi Anu, thanks a ton and no your response is right on time. My friends are coming for dinner tonight. Thanks again for clearing my doubts. Chithra- You are right! For 2 cups flour, you would need 2 to 2 1/2 cups water. Roopa- Hope you like it! Preeti- You can replace equal quantities of water with coconut milk.